The George W. Bush Speech, National Day of Prayer and Remembrance featured is in the form of extracts, passages or lines from the George W. Bush Speech, National Day of Prayer and Remembrance. The George W. Bush Speech, National Day of Prayer and Remembrance demonstrates good oratory skills, a great public speaker with the ability to use clear words and text. Speech Example Topic / Subject Type: Inspirational / Inspiring Speech. On Tuesday morning, September 11, 2001, terrorists attacked America in a series of despicable acts of war. They hijacked four passenger jets, crashed two of them into the World Trade Centre's twin towers and a third into the Headquarters of the U.S. Department of Defence at the Pentagon, causing great loss of life and tremendous damage. The fourth plane crashed in the Pennsylvania countryside, killing all on board but falling well short of its intended target apparently because of the heroic efforts of passengers on board. This carnage, which caused the collapse of both Trade Centre towers and the destruction of part of the Pentagon, killed more than 250 airplane passengers and thousands more on the ground. Civilized people around the world denounce the evildoers who devised and executed these terrible attacks. Justice demands that those who helped or harboured the terrorists be punished -- and punished severely. The enormity of their evil demands it. We will use all the resources of the United States and our cooperating friends and allies to pursue those responsible for this evil, until justice is done. Scripture says: "Blessed are those who mourn for they shall be comforted." I call on every American family and the family of America to observe a National Day of Prayer and Remembrance, honouring the memory of the thousands of victims of these brutal attacks and comforting those who lost loved ones. We will persevere through this national tragedy and personal loss. In time, we will find healing and recovery; and, in the face of all this evil, we remain strong and united, "one Nation under God." The text featured is in the form of extracts, passages or lines from the George W. Bush Speech, National Day of Prayer and Remembrance. 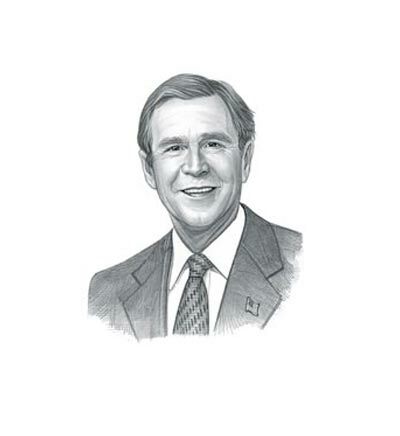 This famous George W. Bush Speech, National Day of Prayer and Remembrance is a great example of a clear address using excellent text to persuade and inspire the audience, a natural leader and motivator a President of America. Use this famous transcript of the George W. Bush Speech, National Day of Prayer and Remembrance as an example of a great oration and clear dialogue. This famous transcript of the George W. Bush Speech, National Day of Prayer and Remembrance originated from a historical manuscript. A Quote or extract from the George W. Bush Speech, National Day of Prayer and Remembrance, provides an illustration of, or allusion to, the famous events the era. This famous George W. Bush Speech, National Day of Prayer and Remembrance is famed for its powers of verbal communication making good use of the words and language to illustrate the subject. Whether this address can be described in the category of powerful, persuasive, motivational or inspirational the excellent powers of oration which are used make it one of the most famous Presidential speeches.